Luxurious stone white daybed, trundle and mattresses with crystal detailing. An ideal way of creating sleeping and relaxing space in any room of your home. The trundle is easy to wheel out. Raises up to the same height as the Sophie daybed to create a super king-size bed. A practical and beautiful piece. Crystal and chrome detailing add to the luxury feel. Sprung slatted base provides you with extra comfort and extended mattress life. Choice of two premier or two platinum mattresses. Premier: Ideal for children or guests. 18cm deep coil sprung mattress with medium comfort. 13.5 gauge bonnell spring unit, plastic side edge supports, 900gsm spring insulator, 270 gsm polyester filling and a Belgium damask quilted cover. Platinum: 18 cm medium to firm mattress with a low profile construction. 13.5 gauge bonnell spring unit, rod edge supports, 900 gsm spring insulator, 500 gsm polyester filing, Belgium damask quilted cover with a quilted border. The mattresses are produced in the UK and comply with all UK fire regulations. Care instructions: Turn mattresses regularly - do not bend or fold. Stone white satin powder coating which is an off white colour not brilliant white. Self assembly required, full instructions included. 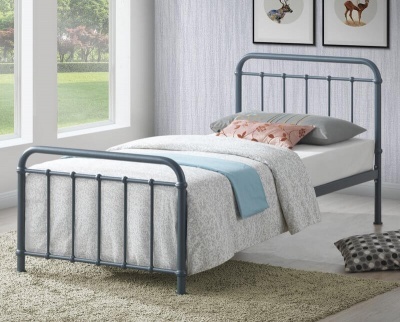 No need to struggle, the Sophie daybed, trundle and mattress package is delivered by a two man delivery team to a room of your choice. Delivered in two boxes plus two plastic wrapped mattresses.